Over the past decade, more than 56,000 former guerrillas and paramilitaries have gone through a process of demobilization in Colombia. As the country continues peace talks with the hopes of ending five decades of armed conflict, the pace of demobilizations grows. Alejandro Eder, director of the Colombian Agency for Reintegration, spoke to AS/COA’s Media Relations Director Adriana La Rotta about Colombia’s experience with disarmament, demobilization, and reintegration (DDR) and how the government shares best practices with other countries in similar circumstances. “What we have done is to identify different actors who work in peacebuilding, and have an ongoing, aggressive policy of exchanging experiences,” said Eder. What sets the Colombian case apart is that the country’s reintegration process began before the peace talks, he explains. But he also warned that peacebuilding depends on society as a whole. “If we want a sustainable peace…we will have to pay a price, which means reconciliation,” he explained. AS/COA: We are not used to hearing about Colombia as a country that can give lessons on security or peacebuilding, but that’s exactly what is happening. When did that transformation start? Alejandro Eder: For the past decade, Colombia has been developing skill sets that have allowed it to turn the tide on the violent situation, and those skills are mainly in the security and peacebuilding sectors. In the past few years, we’ve seen Colombian police officers and Colombian military personnel go to other Latin American countries and even some African countries to share their experience as far as security goes. More recently, in the past five years we’ve started an aggressive South-South technical cooperation strategy through which we share our DDR know-how with other countries that are going through similar processes. And that has been quite effective. Watch clips from Eder’s February 14 presentation at AS/COA, when he shared his experience on demobilization. Here, he gives a rundown on Colombia’s DDR by the numbers. AS/COA: How is the Colombian demobilization process different from other countries that have DDR programs? Eder: All DDR processes are different in and of themselves, but the Colombian process is different in various ways. The first one is that the Colombian DDR process started before the conflict has ended, which means that we’ve been making our way as we go along. That presents certain challenges, but it has also been a very effective way of bringing violence to an end more quickly. The second way is that the Colombian process is being designed, implemented, and financed by the Colombian government. That is very different when compared with other DDR processes, which for the most part are designed, implemented, and financed by the international community. Another difference is that the Colombian process is strategically centered on providing ex-combatants with psychological and emotional stability through a series of psycho-social workshops and education. What we strive to do is to educate people and to give them the tools they need to get ahead in society through their own means, rather than having a subsidized welfare-type program, which is not sustainable in the long run. In his presentation, Eder explained the stigma involved when ex-combatants seek employment. La Rotta: The purpose of your trip to the United States is to promote aspects of the reintegration program, among them South-South cooperation. Why is this important? Eder: South-South cooperation is when countries of similar development levels, or at least not traditional donor countries, exchange experiences and exchange technical know-how so they can improve their own policies and their own processes. There are many countries that are involved in peacebuilding process. Colombia has worked with dozens of former DDR and current DDR countries as far-reaching as Burundi, Uganda, Rwanda, Brazil, Haiti, the Philippines, Indonesia, Nepal, Afghanistan, and Iraq. We have also worked with donor countries that have special skill sets such as Sweden, Canada, the United States, Holland, and Norway. We have also worked with agencies such as the UN Development Programme’s Bureau for Crisis Prevention and Recovery and the UN Department of Peacekeeping Operations. What we have done is to identify different actors who work in peacebuilding, and have an ongoing, aggressive policy of exchanging experiences. 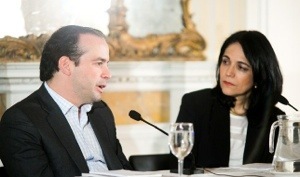 La Rotta: The Colombian government has made tremendous progress in the past decades on its peacebuilding efforts. Is Colombian society also making the same effort to embrace peacebuilding? Eder: The Colombian government and, in particular, President Juan Manuel Santos, have made huge strides in consolidating peacebuilding as a state policy, which will require many years to be carried out and many years to be successfully implemented. I believe that the Colombian government is much better prepared to face any potential challenge that may come in the future as far as peacebuilding goes. However, we do still have a drawback, and that is that Colombian society seems to have not quite yet realized what the full price of peace will be. If we want a sustainable peace which goes beyond the short term and that will materialize at least over the next couple of decades, we will have to pay a price, which means reconciliation and giving—lending a helping hand, not just to people who came out of illegal armed groups but also to the victims of the conflict and to Colombians in general. Eder discussed the price of peace at his February 14 presentation at AS/COA. Uniting opinion leaders to exchange ideas and create solutions to the challenges of the Americas today.